excited for tomorro but legs are killing esp left knee. if i ever do another test gonna split them up as the tension and effort got to me today, sad old sleep deprived mummy! and also thanku for yor congrats ladies ! Half term this week, so little quiet skating time and STILL yet to run through program from beginning to end. Also I improved my two-foot spin - going from skating forwards to turning backwards from right to left (clockwise). I am horribly one sided though, and I have a major block with stopping! 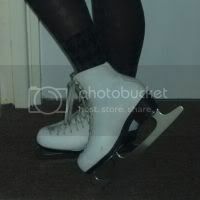 I just can't get the t-stop or snowplough, my skates just wobble and slide and I don't actually stop. Beginner skater, not taking lessons due to not living near enough to a rink, but trying to improve any way I can! Skating in Risport Etoiles with "New English" blades. I was able to do my cross foot spin with 4 or 5 revolutions. First time ever that I can do my sit spin with the full 6 revolutions, though it is not consistent yet (the number of revolutions). Also managed to do teapots without sitting on the ice. Found that if I am not too consciously mind thinking doing the spins, I can do them pretty well; whereas if I am too conscious about them, I cannot do them properly. Suppose that it is something to do with the mind. Not a lot unfortunately! No SkateUk this week cos of half term, the outdoor rink in Leeds is packed, and I've missed a private lesson and SkateUk cos of the recent snow. I'm getting withdrawal symptons, just as I was nicely building up my ice time too! I did my first jump yesteday!! It was a 3 Jump so only a baby jump, but I'm so thrilled I even managed to get airbourne!